Diaper bags are an absolute necessity for any mom or dad with little ones. Why not make your diaper bag stylish and fun!? This will be the perfect way to show off you and your baby's personality. You'll be all the rage on play dates! Being 15" W x 11" H x 5" D, this bag is the perfect size for fitting all the essentials. It is made of durable smooth black canvas material and can be printed with your design on the front or both the front and back. The bottom of the bag has four metal feet in order to easily stand on its own. It has two black handles that are 1" wide and approximately 24" long, which gives about a 13" drop from your shoulder. The top of the bag has a handy zipper closure in order to keep all of your items securely inside. On either side of your diaper bag are elastic pockets for bottles or sippy cups. The interior has a dividing panel in order to keep your items organized! There is also a zipper pocket inside and even an attached key fob. 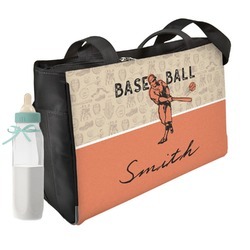 This diaper bag even comes with a changing pad! This is the perfect bag for all your diapers, toys, and more, but can easily transition into being an every tote as well! Once they grow out of a diaper bag you can still keep using it! Dream up the perfect design, then use our design center to make it come to life. Choose exactly what color, font, and pattern you want. Try different monograms, sayings, and graphics too! Creating the perfect design can be a lot of work, so let us know if ever need any help! We are always here to help if we can! Be sure you are stocked up on everything for your baby! We have sippy cups, snack containers, bibs, and more! Go to our Nursery section to find more.